If you’re looking to make money at a casino, but you’re not all that overjoyed at the prospect of luck dictating the size of your pockets, then learning how to play blackjack is the right place to start. Before we proceed, let’s take a quick detour to the history books. Blackjack’s predecessor was a game called ventuina – Spanish for twenty-one. While details of the game’s origins remain largely unknown, the first written references were found in published works by the Spanish author, Miguel Cervantes, at the turn of the 17th century. In it, the game is described through the eyes of two gamblers, in which you must get 21 points without going over, or beat the dealer, in order to win. We’re talking about a period three centuries ago, yet the rules haven’t alternated much ever since. When twenty-one was introduced in the USA, casinos started implementing extra bonuses to attract people’s interest. One of those bonuses, awarding a 10:1 win ratio when you hit an ace and black jack of clubs or spades, is how twenty-one got its modern name that’s predominantly used today. For any new player, blackjack is deceptively simple. On first look, it may seem to you like you’re playing a straightforward game of luck. However, blackjack is an intricate card game, where skill and knowledge can play crucial factors. Naturally, at its core any card game is a game of luck, but there are ways in which you can manipulate with what’s been dealt to you in order to come out ahead. Every journey begins with a single step, which means that we must go over the very basics of blackjack, before attempting anything else. When you hit, you are requesting an additional card from the dealer. You can hit as many times as you want, until you go over 21 which signifies you losing the game e.g. busting. Stand means you are done taking cards from the dealer. You stand when you are satisfied with your hand or you’re in an unfavorable position against the dealer. You double your bet and get an additional card from the dealer. You may not request more than one card when doubling down. You should double when you have a promising initial hand, whereas the dealer does not. When you have a pair of identical cards, you can request a split. The dealer normally proceeds dealing cards to both pairs. The regular game rules apply here, you may hit, stand or double. When surrendering, you forfeit your bet and half of it is returned to you. Surrender is only available once you’ve gotten your initial two cards. Depending on the casino’s policy or game variation in question, surrendering may not be an option at all. This is a term you will frequently meet when reading about or playing blackjack. A soft hand is one that has aces in it. Because an ace can be both a 1 or 11, that hand’s value is not set in stone. A hard hand is a hand without aces, or in which an ace is forcibly counted as 1 point. The objective of the game is to get as close to 21 points, or simply more than the dealer without going over 21. A game of blackjack is played with one to eight basic decks of 52 cards. Every card is assigned a numerical value. 2 to 10 hold their original face values, while face cards (jacks, queens, kings) have a set value of 10. Aces are counted as a 1 or 11, depending on which option favors the player. Initially, cards are dealt to players in groups of two. Hitting as the game progresses adds more cards to your hand in increments of one. Your hand is the value of all your cards combined. As a beginner, you can be very vulnerable to blackjack. Not knowing which variation to play, how the game basics work, or what you should avoid in general can be hurtful to your gaming budget. When the dealer has an ace as his face-up card, whereas his other card is unrevealed, you have the option to make an insurance side-bet for up to half of your initial bet value. In case the dealer hits a blackjack, the insurance bet wins 2:1, otherwise your stake is lost. Any sensible person will advise you to never make insurance bets, the risk is not worth it. It is estimated that the house gains an approximate 7% edge when players take insurance bets. All blackjack tables have varying rules that may sway your attention towards it. However, under no circumstance, should you play a table that pays 6:5. It is known that the fewer decks a blackjack table uses, the better your odds are, but even if a single deck table pays out 6:5, you should still avoid playing. The payout difference is too significant to be ignored. Across land casinos, many players believe that it matters which position they sit on when sitting on a multiple players table. In truth, it doesn’t matter where you sit. The fact of the matter is that it’s you against the dealer, regardless of players around you. The odds are the same either way. Now with the advent of live online blackjack tables, these types of myths can be easily carried over. Simply put, enjoy your game and don’t worry about your position on the table. The only true benefit of sitting on a spot furthest than the dealer, is that you’ll have more time to think over your next move. When trying to win blackjack, a common misconception, or rather misleading way of play, is to solely focus on your own set of cards. In blackjack, paying attention to the dealer’s hand is of equal, if not greater, importance. While hitting a blackjack (21) is what the game’s marketed around, beating the dealer is what you should be focusing on. The dealer’s hand should be your main point of reference on deciding your next move. Next what you should know is that there is no surefire winning strategy. However, there is a plethora of blackjack strategies can significantly increase your odds of winning, and increase your profits in the long run. If you’re looking to get serious into playing blackjack, learning the basic strategy should be number one on your to-do list. Assuming a six-deck table where the dealer stands on a soft 17, by employing basic strategy you can reduce the house edge to about 0,4%. That’s odds you should take any day of the week. It may take a while to memorize and master, similarly to the periodic table in chemistry class, but the payoff is worth it. If you take the time and learn basic strategy, you be ahead of over 90% of blackjack players right off the bat. As with every online casino game, people will falsely advertise surefire winning strategies that will supposedly put a Ferrari in your garage in a month’s time. Do yourself a favor and avoid buying into people telling you, or even worse – selling, misleading information of betting systems. We’ll take the arguably most popular betting system – the Martingale, as an example. The Martingale dictates you double your bet after each loss, so no matter how much you lose in the end you’d at least break even. It sounds perfect upon first glance, but far from it. In fact, the Martingale is one of the most flawed, dangerous betting systems around. The reason Martingale is still widespread is because sometimes it can work in the short run. However, the very concept of doubling your bet after a loss can be devastating. Assuming you start with a £5 bet, a string of 10 losing hands in a row puts you at a wager of £2560! Now, you may think to yourself “10 losses in a row, that seems unlikely!”. Well, not unlikely enough. Taking our example of 10 losing hands in a row is a very light example of variance. It can happen much more often than you think. Moreover, let’s not forget about your personal bankroll limitations and max bet table limitations to boot. A betting system could reliably work only with an infinite bankroll at a limitless table. Finding the best blackjack table to play on can be trickier than it seems. Online, there is a wide array of game variations that may confuse you. We’ll explain what you should look for in a blackjack table before putting real money into play. If you don’t see the words written above on the table you’re contemplating to play on, don’t even consider putting your money at stake – no exceptions. If you value entertainment above winnings, then disregard this advice, but for maximizing profits always look at 3:2 paying tables. This question is often debated, and the answer is that it does favor the dealer to hit on a soft 17. The difference in house edge may not be as much (.2%), but preferably you should look for tables where the dealer does on a soft 17. In addition to the above, preferably look for table with as fewer decks as possible. Also, being able to double after a split, split aces and surrender are all beneficial rules that help towards zeroing in on the house edge. You won’t be able to find tables ticking all the right boxes, but you should look for tables with at least one or two of the mentioned rules. If you wish to learn the basics of dealing blackjack, the first thing you should do is learn how to play the game. Zero in on the ins and outs of blackjack and all the rule variations, before proceeding to deal. In many casino-centric cities, there are schools for this, meaning that it is far from a simple task. Professional blackjack dealers have to master the basics and abide to the specific set of house rules a casino has. Every casino has different dealing methods, meaning there is not a universal way of dealing. If you’re looking to have some fun with a group of friends and act as the dealer, the basics will do just fine. Below you’ll find a simplified step by step instruction. Shuffling the deck/s is mandatory. To achieve optimal results, look for basic shuffling tutorials that will ensure there is no foul play at hand. After a shuffle, offer a player to cut before dealing. This step is quite self-explanatory. If you’re employing the role of a professional dealer, waiting for all bets to be placed is mandatory. Players can’t place bets after the cards have been dealt. Start dealing to the left-most player first in a clockwise rotation. Start by dealing each player a single face-up card and lastly deal a face-down card to yourself. Proceed in the same manner, but the second card you deal to yourself should be face-up. If your up-card is an ace, ask if anyone wants to purchase insurance before proceeding. Insurance bets are side-bets that pay 2:1. The stake of an insurance bet must be half of the player’s original bet. 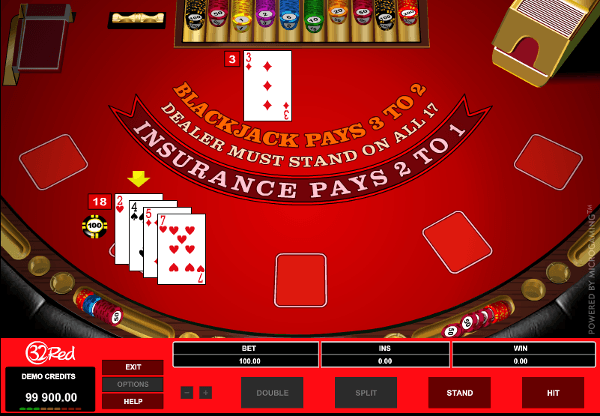 If a player takes insurance, flip over your second card to see if you have blackjack. If you do, pay the insurance bet and collect the rest of the losing wagers. Players with blackjack get their original stake back, regardless if insurance was purchased. If your up-card is not an ace, then the game proceeds as per usual. Now it’s time for the players’ turns, again starting from left to right. Players can hit, stand, double down, split and surrender (if you decide to use surrender as a rule, note that players can only surrender once their initial hand has been dealt. In case of a surrender, pay back half of a player’s wager and take their cards). When a player hits, you will deal them one card face-up. There is no limit to players requesting hits, but once their hand amounts to over 21, they go bust and you must collect their stake and cards. If a player decides to double down, deal them one more face-up card only. They may not request additional hits past that. Double down bets are settled once your cards have been revealed following regular play. If a player splits, you have to deal them two new face-down cards for each of the split cards. After that, the game proceeds as normal and the player can hit, stand and double as if two players were playing. When a player stands, move on to the next player. Once the first cycle of play is concluded, it’s your turn to play. Reveal your second hard. If it amounts to 16 or less, deal another card to yourself until its worth 17 or more. Once your hand reaches a value of 17 points or more, you should stop dealing. If your hand value surpasses 21, you go bust and all players still in the game get paid. When the value of your hand and a player’s hand is identical, that is called the push. In that case, return the original wager back to the player. Lastly, we’ll mention again to carefully learn the rules of blackjack to heart. In a game of blackjack, the dealer assumes the position of authority. Any disputes among players will have to be settled by you, assuming you are dealing in a non-professional setting. This guide will help you have some fun in a homely environment, where you can have fun with a group of friends and spice up that entertainment with a couple of friendly wagers. If you’re looking to become a professional dealer, you must attend a dealer school and get a license.